We absolutely love this area because of the climate,redwoods,proximity to the ocean,mountains and 6 great rivers. In addition the area is blessed with multitudes of music venues,culture, Farmers markets, art shows and great people. and in 2 hours we carried out approximately 25 lbs. of litter of all description at Clam Beach County park. Kimberley with bags full of litter found on Clam Beach. 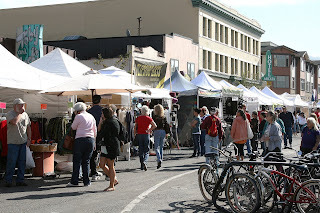 On the same day we attended the "North Coast Fair" at the Plaza in downtown Arcata. Local artists playing for the people of Arcata. We were entertained by the local "African dance team" on the Plaza. This dude was strange but willing to pose for a photo. 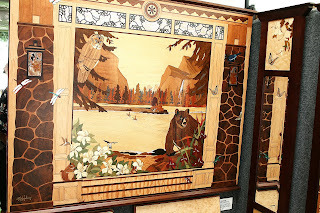 wood inlay of Yosemite and wildlife hanging on my wall but it was very expensive. The Cactus man with his hat of many feathers at the Farmers market. It was another great day in Humboldt county. I invite you to come up and visit next summer when the Plaza is full of sun and action. Very much a California scene, I would say. As hard as I tried, I could never sway my friends in N VA to appreciate the California scene. The stories just didn't work. Doesn't matter though, because we have too many people here already. Now hear this Terry, to really get into the spirit of the North Coast you have to try roasted lamprey. The Eel River is filled with them, isn't it? I'm way ahead of you on the Roasted lamprey as I recall as a boy. We lived off the land for more than a year and friends who were of Russian decent (they called themselves "white russians") shared some "eel" with us. Most of the rivers have Lamprey which as you know are anadromous. Their numbers have been depleted. Don't remember which river it was -- Sonoma or Gualala -- but in response to complaints by sports fishermen Cal Fish & Game did a dietary study of sea lions at the river mouth where the fishermen were so concerned. They found the sea lions' stomachs were chock full of lampreys.